Indo Amines Ltd. is in portfolio of Subramanian P. He is one of the top investors in India. The company belongs to Chemicals sector. As per the Company website it is developer and supplier of Fine Chemicals, Specialty Chemicals, Performance Chemicals, Perfumery Chemicals and Active Pharmaceuticals Ingredients. The products manufactured find application in various industries like Pharmaceuticals, Agrochemicals, Fertilizers, Petrochemicals, Road Construction, Pesticides, Perfumery Chemicals, Dyes and Intermediates. The chart says it all. In year 2002 it was trading below 1 INR mark it was trading at .50 INR. 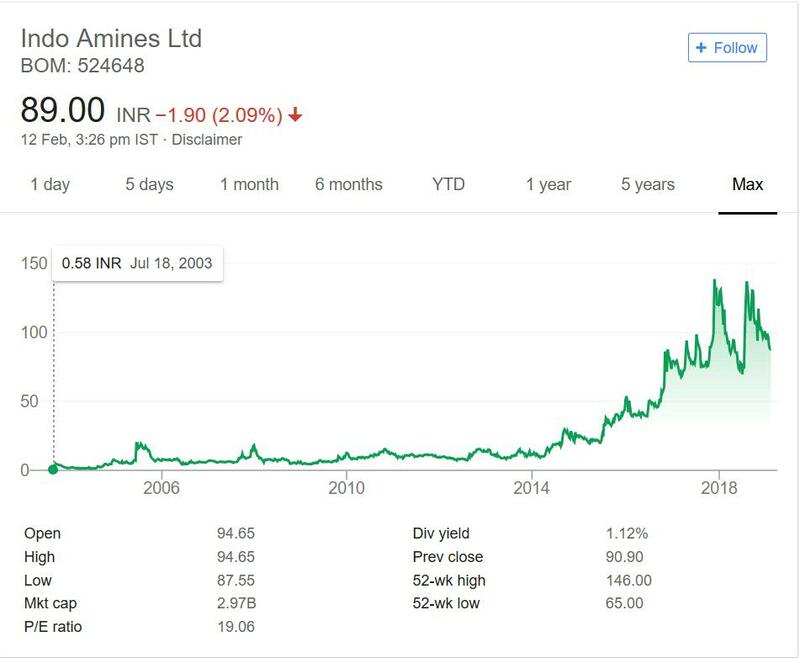 From year 2002 to year 2014 stock gave 20 times return. In year 2014 it was trading at 10 INR mark. In past few years it made fortunes for investors. It gave 9 times return from 2014 level with in short span of time. So 2002 investors are sitting at 180 times return in past 16 years. If you take the peak price into consideration then return come close to 300 times. The dividend yield is 1% at current market price. So the 2002 investors are getting 4% dividend. It has proved to be wealth creation machine for investors over the years. Indo Amines is in Chemicals sector. As mentioned above it creates wide range of chemicals consumed in different industries. Over the years Company has grown multiple fold and made huge money for investors. Subramanian P has few chemical companies in his portfolio. The reason is simple this sector has given great returns in past few years. The sector will continue to grow in future as well. The demand of chemicals in different industries is on rise and will remain so. I will track this company to get more information about it. I would also analyze individual chemical compound to learn about their usage and entry barrier. As of now I have already invested in Chemicals sector and do not want to increase exposure to single sector.In case you are interested then you can track the company by adding it to your stock watch list. That way you can keep close eye on the Company.